The Chukar (Alectoris chukar) is a Eurasian upland game bird in the pheasant family Phasianidae of the order Galliformes, gallinaceous birds. Its native range in Asia from Pakistan and Kashmir, India and Afghanistan. It is closely related and similar to its western equivalent, the Red-legged Partridge, Alectoris rufa. The Chukar is a rotund 32-35 cm long bird, with a light brown back, grey breast, and buff belly. The face is white with a black gorget. It has rufous-streaked flanks and red legs. When disturbed, it prefers to run rather than fly, but if necessary it flies a short distance on rounded wings. Chukar prefer rocky, steep, and open hillsides. 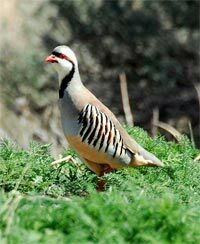 The Chukar is a resident breeder in dry, open, and often hilly country. In the wild, Chukar travel in groups of 5-40 birds called coveys. It nests in a scantily lined ground scrape laying 8 to 20 eggs. Chukars will take a wide variety of seeds and some insects as food. 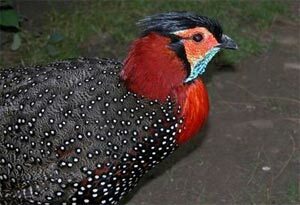 When in captivity, they will lay 1 egg per day throughout the breeding season if the eggs are collected daily. For hunters, Chakur is a very challneging bird becuase of its surgical upward flights and sudden disappearances in the bushes. The hobby of bird-watching -- spotting and identifying bird species -- is well-established in Europe and the United States. More than 400 species have been spotted in and around the city, leading some diplomats and expat workers to say it is the best capital in the world for observing birdlife. 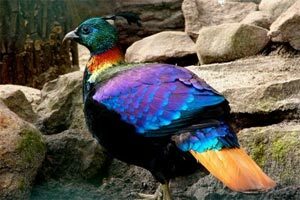 Pakistan is a country of diverse wild life in its Indus valley planes, fresh water lakes, ice capped mountains, deserts, plateaus, and its 1000 KM coastline. There is wide variety of bird species in this region. Pakistan is not well equipped for birding activities in general. There are no regularly planned birding trips. The sites below are recommended for safe birding activities. The ideal bird watching season is winter when a wide variety of birds visit the wetlands and planes of Pakistan from Siberia. However, during summer the high altitude mountain areas (from 5,000m to 8,000m) of Northern Pakistan can be visited for watching unique species of resident birds. Famous areas include: Chitral National Park, Gilgit Valley, Biltistan, Khunjrab National Park, Hunza Valley and Nanga Parbat tracking area. There are ample facilities for bird watching tourists in these areas. Some other important areas are, among others: Chiltan National Park at Hazar Ganji, Ayubia National Park, Doesai National Park, and Kirthar National Park. Who has recently joined the Bird Club of Pakistan to make contact with fellow amateurs in Islamabad, believes more of the city's residents are slowly coming to appreciate the glorious birds that surround them every day.